It's no secret how much I love going for Afternoon Tea. There's something about unwinding while enjoying a selection of sweet and savory bite-sized pasties delicately displayed on a tall multi-tier rack. 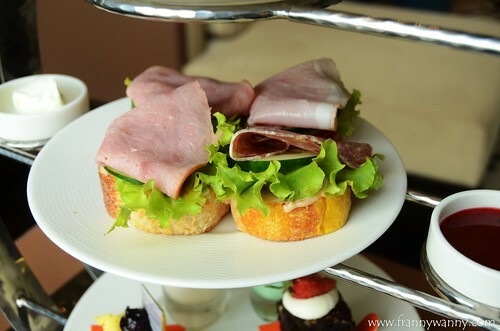 Since Paul had work on Saturdays back when we were in Singapore, I'd spend those free time with my girl friends as we would try the different hotel high teas around the city. 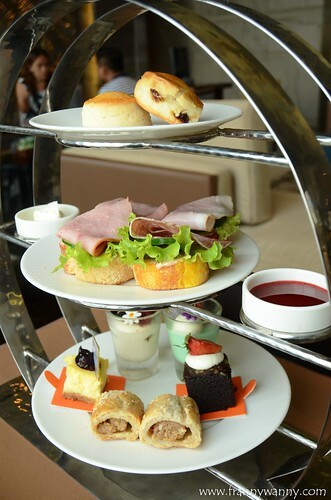 Since high tea is traditionally very British, I'm happy though that this practice is picking up pace here in the Philippines where the American influence is relatively strong. 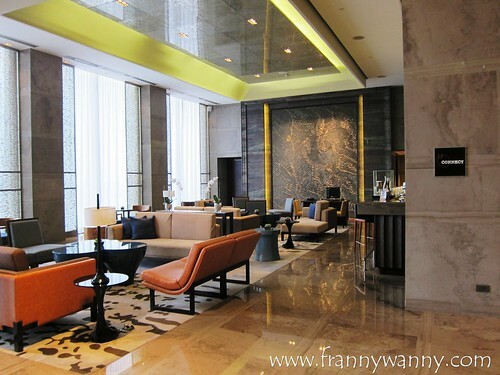 After checking in and settling in our room at Marco Polo Ortigas Manila, Paul and I headed back to the 24th floor where Connect Lounge is located. 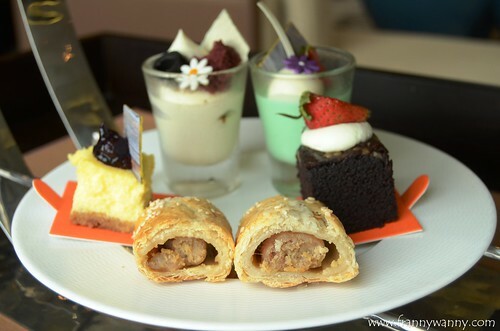 They have an ongoing high tea promotion for only Php. 788 per pair and we were excited to give it a try. Similar to all dining establishments in the hotel, Connect Lounge also boasts of an amazing view overlooking the Ortigas and Antipolo area. Within minutes, our three tier rack was served and I must say that the quantity and selection was quite modest. Each set comes with our choice of coffee or tea. You can also opt to add a bit more should you want to have a glass of smoothie, iced tea or wine with your snacks. 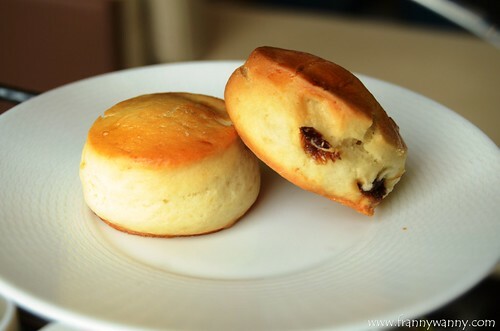 The top most tier has two pieces of scones. I thought it was quite good and do appreciate the strawberry jam that came with it. Sadly no clotted cream but they served what looked like whipped cream instead. Next was a variety of cold cuts on pastries. Paul had all of it as I sadly couldn't take any cold cuts at the moment. He said it was really good and gave it a thumbs up sign. The bottom tier had all sorts of sweet pastries except for the two pieces of sausage puff pastries which I loved. It was a bit cold when served which I think was quite odd but otherwise, it was good! I also liked the Blueberry Cheesecake as well as the Brownie too. While it wasn't very filling, it's a pretty good selection for the price. 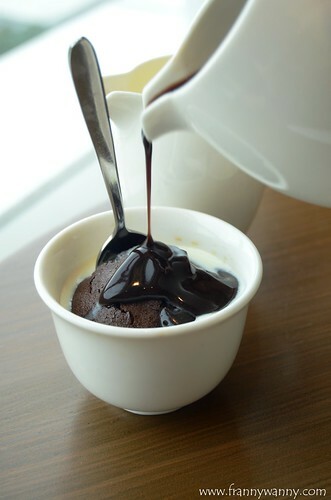 In addition to this, each set comes with two cups of Chocolate Fondant which was like a Molted Chocolate Cake. This one was yummy! We weren't actually expecting this to be served as it came after we consumed most of the items on the rack and the server told us that we still got our chocolate treat coming. Kids and chocoholics will surely love this. Admittedly, the selections were not very filling and sadly no refills were made available. This is good for light eaters and those who just wants something to munch on while catching up with their friends. Then again, it's still a very reasonable variety for the price. Check out Connect Lounge at the 24th Floor of Marco Polo Ortigas Manila, Meralco Avenue and Sapphire Street, Ortigas Centre, Pasig City.